Saint Eligius was born near Limoges, France around 590. He became a talented metal smith and became master of the mint in Paris. He became good friends with King Clotaire, and his reputation for his talent at his craft brought him great fortune. He used his money to help the poor and built several churches, a monastery and a convent in Paris. In 640, he was ordained a priest which was his lifelong dream. He was kind and happy all the time, everyone liked to be around him and he attracted many to the faith. He later became a bishop and his preaching became famous. He made numerous converts before he died in 660. He was honest, kind and faithful and now, his example still shows us to simply do a good job at whatever we do, while always being a good person. His feast day is December 1. St. Eligius was born in Chaptelat, near Limoges, France around 590 A.D. to Roman parents. At a young age, his father recognized that his son had an unusual talent and sent him to the famous goldsmith, Abbo, who was the master of the mint at Limoges. Later on, Eligius went on to work at Neustria. From there, he was recommended to Clotaire II, king of Neustria, who commissioned him to craft a throne of gold adorned with precious stones for him. The honesty of the saint impressed the king, and he was rewarded by being appointed as master of the mint at Marseilles, and by being taken into the royal household. After Clotaire II’s death, the new king, Dagobert, appointed Eligius to be the king’s chief councilor. Eligius eventually became so well known that ambassadors paid their respects to him before going on to see the king. The charitable and honest Eligius took advantage of his status to obtain alms for the poor and to ransom Roman, Gallic, Breton, Saxon, and Moorish captives who were arriving at Marseilles daily. He was able to get the king’s approval to send his servants through towns and villages in order to take down and bury the bodies of the criminals whose bodies were executed and displayed as a further punishment. He founded several monasteries to which he introduced, at least partially, the Irish monastic rule. He also built the basilica of St. Paul and restored the basilica of St. Martial in Paris. In honor of the relics of St. Martin of Tours, the national saint of the Franks, he had several churches built. He did the same thing for St. Denis, whom the king had taken as a patron saint. At court, Eligius and his friend Dado (Audoenus) lived a life that followed the Irish monastic rule, introduced into Gaul by St. Columbanus. When King Dagobert died, Queen Nanthilde took the throne. At this time, Eligius and Dado left the court and entered the priesthood. When Acarius, the bishop of Noyon-Tournai died on May 13, 640, the clergy and people unanimously made Eligius his successor. Because the majority of his diocese was pagan, Eligius undertook the conversion of the Flemings, Antwerpians, Frisians, Suevi, and the barbarian tribes along the coast. When the body of St. Quentin was discovered, Bishop Eligius had a church built in honor of the saint. Adjoined to the church was a monastery under the Irish rule typical of Eligius’s rule. The bodies of St. Piatus and companions were also discovered during his episcopacy, as well as the remains of St. Fursey, the celebrated Irish missionary who died in 650 A.D.
Eligius died on December 1, 660 and was buried at Noyon. 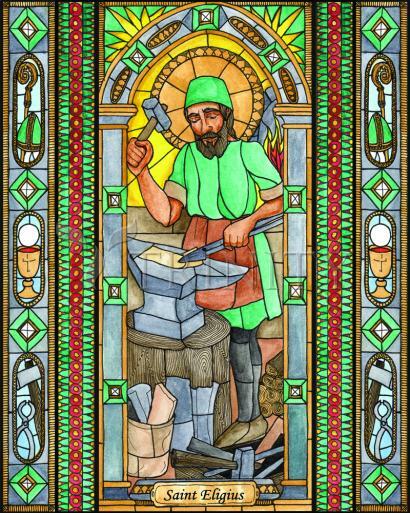 St. Eligius is the patron of goldsmiths, blacksmiths, and all metal workers. Taxi drivers have also put themselves under his protection.